The Revenger X Kit by Vaporesso is here at E Cigarette Empire and it is one of the best starter kits of 2017 that you could possibly get your hands on! The Revenger X Kit is the new and improved version of the previous Revenger Kit. There are many upgraded features so let’s hop right into it. The first thing is that the brand new Revenger X Kit is features a touch screen front panel instead of having buttons like the previous version. The touch screen is very responsive and embedded with high quality technology. With the touch screen being implemented and the buttons being rid of, it gives the new Revenger X Kit a more sleek and stylish look to it. Another big change is the Omni Board. This new starter kit features the latest OmniBoard 2.2 version which has a lot of tweaks and upgrades to it. The Revenger X Kit by Vaporesso still comes with the famous NRG tank which has multiple coil options to match your preference. The Revenger X Kit comes in 5 different colors which all have an extravagant paint job. Upgrade your Vape Mod today to the best of the best! Beats smok junk. Exceptional vape, but burns coils fast. This mod is worth every dollar. Smart settings automatically adjust to recommended wattage of coils. It has everything a mod should have and is the perfect size. I have the green set up and am extremely pleased with this tank and mod. It's easy to set up eventhough it's touch screen. The flavor is wonderful!!! Very well made box mods. May have to get myself one in blue when they have them back in stock! Highly recommend this set up!!! 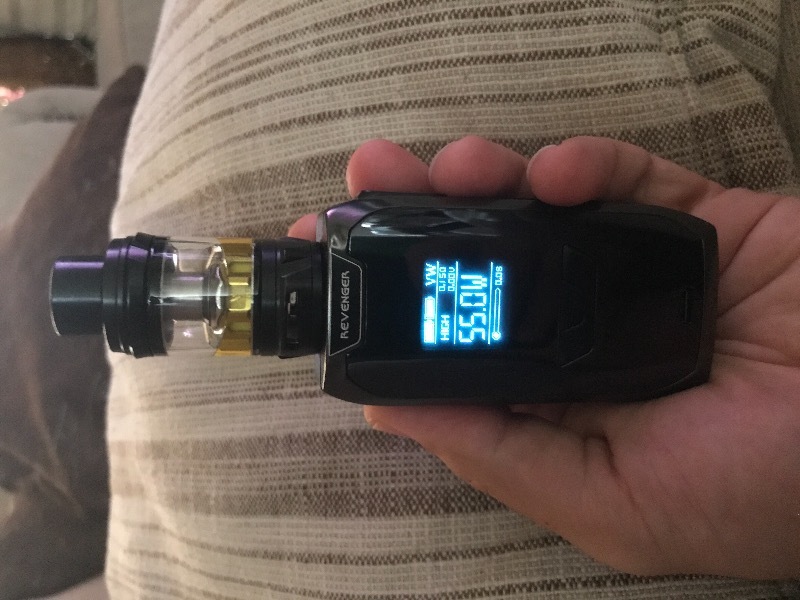 Revenger X is very sweet vape.